As I prepared to head out to the 24th week of the Frost Park Chalk-Off’s fifth year, I began my Friday, September 14th, by watching Hank Green commemorate 1,000 Vlogbrothers videos. 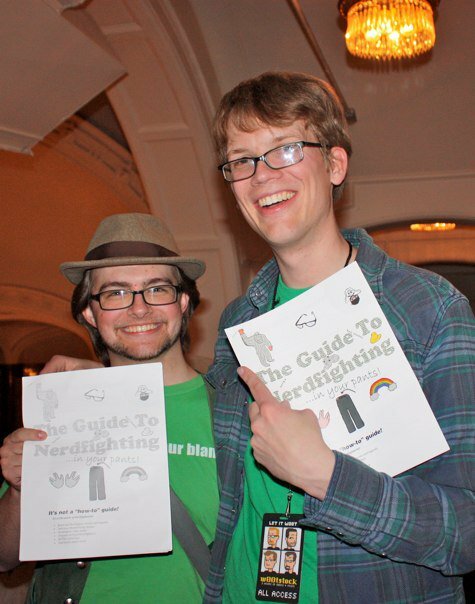 Adam and Hank Green display 'The Guide to Nerdfighting' at w00tstock 2.0 in 2010. Photo by Austin Muirhead. Of course, the Vlogbrothers have made well over 1,000 videos. Aside from not counting the videos they’ve put up on their other channels (Crash Course, SciShow, Hank Games, Truth or Fail and so many more), they’ve technically already achieved 1,000 videos in the Vlogbrothers line alone. To begin with, the second Vlogbrothers video was mistakenly uploaded to John’s personal channel. Right from the start, that adds an extra number to the Vlogbrothers videos that doesn’t appear in the number of videos on their actual channel. Even if you discount that, however, you have the problem of the disappearing video. Now, I’m not talking about temporary videos, such as videos announcing live shows. I’m talking about a specific, completely official Vlogbrothers video that has, for reasons I don’t personally know, vanished from the Internet. Needless to say, I was shocked. I’m sure there was some valid reason to do so, but I couldn’t find an explanation anywhere. 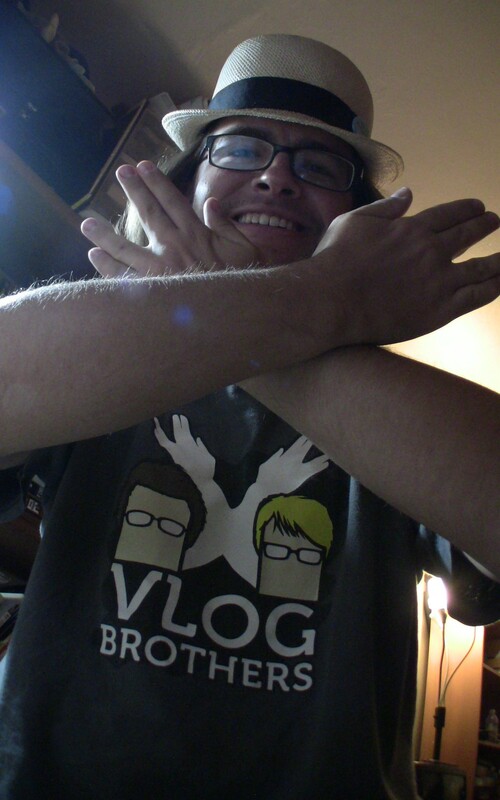 Still, time moved on, and so did life, YouTube, and the Vlogbrothers. It does leave a peculiar little question, though: what actually counts as the 1,000th Vlogbrothers video? Do we factor in the second video ever, which still lives on John’s other channel? Do we count a video that, having been seen by thousands, ceased to exist only after silently slipping away into the archives? Then again, there are videos like Week 1 Condensed which, perhaps, shouldn’t count. Does that even out the count, or simply complicate matters further? In the end, to blatantly steal a line from Linkin Park, it doesn’t even matter. Much like the argument over when the Millennium started, the purpose of celebrating a big, round number isn’t accuracy. The point is to acknowledge that something momentous has occurred, that time has passed and we’re still around to enjoy the future. It’s a time to reflect and a time to look forward. Whether 1000 VIDEOS!!! was actually the 1,000th video or not, the Vlogbrothers have accomplished something. They have endured the passage of time. They have grown and changed, and the community that surrounds them has grown and changed as well. We’ve come a long way from the small tribe that Nerdfighteria used to be, watching two brothers engage in textless “communcation” in pixelated 240p. Adam the Alien shows off his Nerdfighter pride. Five years ago, Nerdfighting was a small subculture of YouTubers filming and/or commenting on low-quality, 4:3 videos shot in poorly lit rooms and basements. Today, it’s a thriving global community that counts Olympic athletes and pop culture icons among its ranks. Some will look back and miss the old days. Certainly, the allure of nostalgia seduces all of us from time to time. But the Nerdfighteria has grown into something far more amazing than any of us could have envisioned in 2007. It changes far more lives, – whether through actions like the Project for Awesome or simply by existing as a community for people to identify with – than it ever could have in those days. 1,000 videos is an arbitrary, meaningless measurement of something which is utterly immeasurable. But it’s a great excuse to look back, in complete and total awe, at how far we’ve all come. I’m proud to have seen Nerdfighteria grow into the unstoppable beast of awesome that it is now. I can’t wait to see where the future will take us. The music behind the chalk art time-lapse is Nerdfighteria Island by Hank Green. The song can be found on his second studio album, This Machine Pwns N00bs , available from DFTBA Records. If you’re a Nerdfighter, I’d love to hear your answer to “When, how and why did you become a Nerdfighter?” If you’re not a reddit user, go ahead and answer in the blog comments below the photo gallery. For those not familiar with the Frost Park Chalk-Offs, they happen every Friday from Noon to 1pm – April through October – on S. 9th & Pacific Avenue in Tacoma, Washington. The art is then voted on by anyone who cares to from 1pm to Midnight Pacific Time on FeedTacoma.com. Check out my shots of this week’s artwork below, then head on over to the FeedTacoma thread to see how the voting went this week. Adam and Hank display The Guide to Nerdfighting at w00tstock 2.0 in 2010.